After nearly a two month delay, Cerulean Studios finally managed to get the iPhone version of their popular multi-protocol Trillian chat client listed in the App Store. While other similar Apps such as BeejiveIM have been available for sometime, Trillian will interest customers using the desktop version as it offers a similar experience. 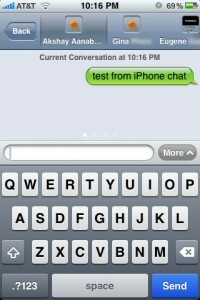 Trillian for iPhone supports connecting to the AIM, ICQ, Windows Live Messenger, Yahoo! Messenger, and Google Talk protocols. After downloading Trillian from the App Store, users are prompted to login with either an existing Trillian Astra Account or to register for a new one. As I’m a existing Trillian Pro customer, I typed in my information and it immediately logged me into my AIM, MSN, and Yahoo! 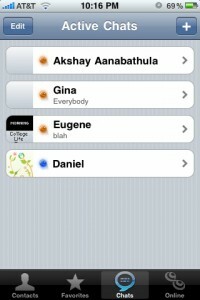 chat accounts, displaying all my contacts. There’s even an option to sign in as invisible. 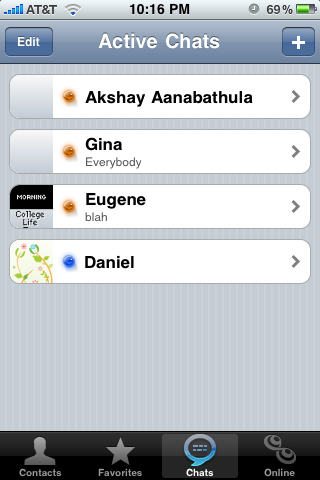 The home screen displays your username, avatar, status, connections, and the contacts directly below. Users will have the ability to add new contacts for any chat protocol, pick a nickname, and even a place them in a group while on the go. The search function also makes it easy to look through large buddy lists. The Favorites Page makes it easy to access contacts you chat with most often without having to scroll or search through the entire list. The Active Chats page lists all the conversations currently in progress. Clicking on any conversation will open a tabbed chat interface. There’s an easy side-to-side scroll for switching through different conversations quickly. While I was disappointed to see that there was no landscape mode, I was glad to find that clicking on the “More” button offered the ability to view the user’s information, buzz the contact, and even send a photo. According to the support forums, a landscape mode has been developed, but wasn’t included. It might be thrown into a future update. Overall I was quite satisfied with the the App. It was quite responsive and was easy to use. Since the iPhone doesn’t support running background Apps, Trillian supports Push Notifications. Once logged in, if you exit the App you’ll be able to continue to receive notifications each time you receive an instant message. Clicking on the App will return you the conversation without loosing any messages. Plus if you’re a user of the Desktop version, it instantly synchronizes data between both. 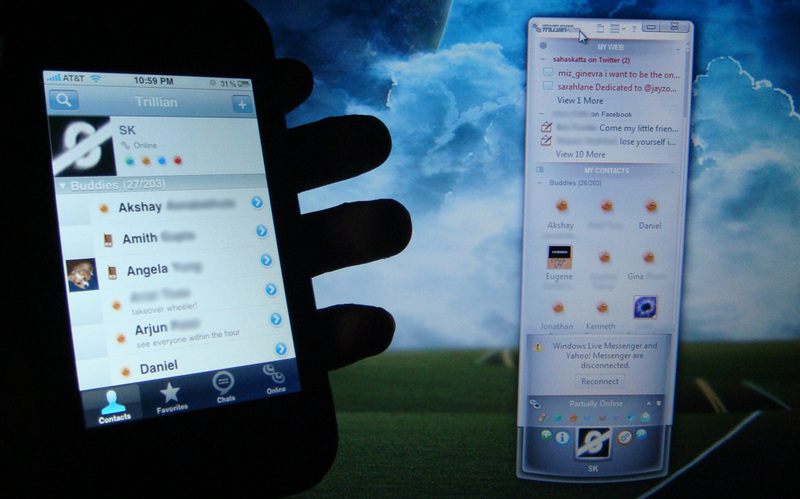 The addition of a contact, a rename, or anything else on either iPhone or the Desktop Client will be relayed to the other. It also supports remaining logged into Astra, AIM, and XMPP accounts on both devices at once. I would like to see chat history and support for other services also included for Yahoo! and Windows Live Messenger. 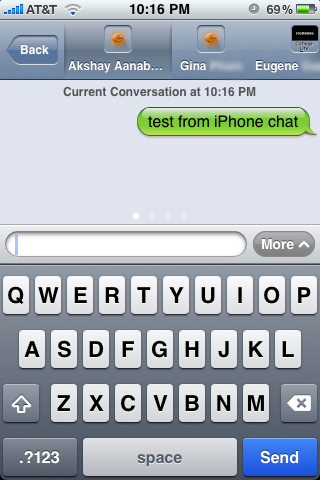 The other feature Trillian for the iPhone lacked was support for Facebook Chat. While the Facebook iPhone App allows chat, it would still be nice to see it offered within Trillian as it’s a centralized location. Plus, it would be convenient with Push Notifications already supported. If you’re interested, it’s available for download now from the iTunes App Store. While it would have been neat to see Cerulean Studios offer paid Trillian Pro customers the iPhone App for free, if you’re a heavy chat users like me, the $5 price isn’t too bad. It’s currently listed as the #1 paid application in the social networking section at the time of publishing this article. If you only chat occasionally, you will probably survive just fine with the free AIM or Yahoo! Messenger App or even IM+ Lite. However as a long-time Trillian fan, I couldn’t resist paying a bit to get the same experience on my iPhone. Thanks a lot for the review and your support for our product. This is one of the best and most comprehensive review I had read so far. I am glad you enjoy the seamless user experiences and designs in Trillian. We surely put a lot of time polishing them! We are definitely considering adding Facebook Chat and Landscape mode in future, so please stay tuned for future updates! – Pak-Kei Mak, Chief Designer, Cerulean Studios / Trillian.